Sunrisers Hyderabad is one of the dominant teams in the IPL. Since their first IPL season in 2013, they have been a consistent side. Except for 2014 and 2015, when they finished sixth in the points table, they have always qualified for the playoffs. In 2013, they reached the playoffs under the captaincy of Kumar Sangakkara. In 2016, they won their first title under David Warner. In 2017, they finished in the fourth place and last season they finished as runners-up under the leadership of Kane Williamson, who led the team exceptionally well in the absence of first-choice skipper Warner. Primarily known for their excellent bowling attack, the Sunrisers have quite a few records to their name. 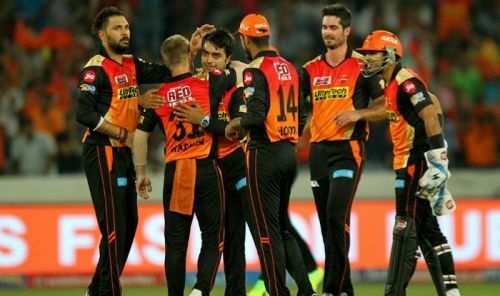 In this article, we will have a look at five unique records held by Sunrisers Hyderabad and their players in the Indian Premier League. Sunrisers Hyderabad, for the last three years, has been very consistent. They have had a very good mix of quality bowlers and batsmen in their side, but if there is an area that they are renowned for, it is their bowling. They have always been a great bowling side and their bowlers have had incredible success over the years, from Dale Steyn to Bhuvneshwar Kumar, and from Amit Mishra to Rashid Khan, they have had top performers in the IPL seasons one after another. Since Sunrisers' first season, i.e. 2013, it has been 32 times that a bowler has taken 19 or more wickets in an IPL season. Eight of them have been from Sunrisers, which is the highest for a team, while the second highest is six each for Mumbai Indians and defending champions Chennai Super Kings.